"Ah, there is nothing to beat good freshwater fish if you eat it when it has been alive half an hour ago and has come out of the pan half a minute ago,"* Halin spoke to his four young Elhil charges as he reached over to grab a large chunk of trout. As the huntsmaster of House Daerleon, Halin was responsible for teaching the children the ways of the untamed forest. They were currently on the third day of a fortnight trek from Gloralion to Tinindal, and his charges were absorbing everything their teacher had to show them. After a long hike, the children promptly set up camp, forming small shelters from scrub and hastily starting a small fire. They then went to the banks of the Mendel River, quickly plucking a dozen trout from its icy depths. Yes, they had learned well. "Tell us a tale!" one of the children cried. "Pray, tell for us a chilling tale!" another begged. Halin waited for what seemed an eternity before responding to the children; the huntsmaster was trying to teach the children patience. But Halin could not remain silent for long. The children had done too well, had listened too intently, not to abide by their request. His goal had been to show these children nature's secrets and how to use that knowledge to live in harmony with the land. Now he saw an opportunity to share with his pupils another story, one not of harmony but of discord. A story about how things in nature-and in life-did not always work out as intended, about how for every good there was an evil, for every victory, there was a defeat. Yes, it was time to teach his children about some of the less pleasant realities in the history of the elves. "Very well. Hmmm, let's see, where shall I begin? How about a tale of the earlier years? Yes, yes, that's it. A story my hunstmaster told to me when I was but a lad." "Aaww," the young elflings cried. "We've heard this tale 'afore! This is where the elves win the Battle of the Sarum through their heroic actions. This isn't a scary tale, not scary at all," one of the young Elhil whined. "Ah, you think you know of what I speak? Mayhap you should be the one telling it, not I," Halin countered. "No! No, please! We'll listen!" the young one shouted, fearful that their teacher would stop his tale. "That is good, for the tale I tell now is an important one, one that has a side to it you may not have heard," he continued. "Let's see, where was I? Oh yes." "Yes, it is true that this refers to the battle of the Sarum. As they had been in the past, the elves eventually were victorious over the numerous but unintelligent orcs. And thus the story ends ... or so your elders would have you believe. But there is more to this story, oh much more. It explores the depths of darkness. And this is the tale that many would not have those as young as yourselves hear, a tale I shall tell if you but promise not to utter it again." "We promise! We promise!" the children cried. Smiling, Halin continued, knowing he now had a captive audience. "It was then that the mightiest of all elf-houses at the time, the House Al-Dustriel, joined the orcs in the fight against their elven brethren. No one knows why, but whispers say that the Dweller in the Vale herself had some connection to Balanuil, the ruler of Al-Dustriel, and she tricked and manipulated him and the other elders of the house into believing that the orcs were in the right and the other elves were in the wrong." Seeing the shocked faces of the children, Halin nodded. "Yes, and so powerful was Al-Dustriel, the Star of the Elves, that they prolonged the war for many centuries. Eventually, however, the other elves of Alustel prevailed against Al-Dustriel and the orc hordes. Al-Dustriel, deserted by the Dweller and the orcs left alive, tried to sue for peace, but the other elves refused. The mark of the Dweller was on House Al-Dustriel, and by the right of possession of the Holy Swan Alfain they proclaimed that all of its members were doomed. The elves of Al-Dustriel were thus trapped and awaiting their death as the army of Alustel advanced on their last stronghold." "Now, the Holy Swan of Alfain was created by our lord, Tal-Allustiel, as you know. This creature, this Swan, creates a small channel to the Maelstrom, an incredibly powerful place of pure energy, energy that is actually all around us right now." Pausing briefly to allow the tension to build in his young wards, Halin continued. "But there was more to the Maelstrom, for residing there since the time of the gods was a demoness of power." "Now your arcana teachers may say that no creature may live in the Maelstrom, but they will not speak of this creature, this demoness. In part, your teachers are correct, for no being can live in the Maelstrom and survive, regardless of the power it wields. But there is more to the Maelstrom than your teachers will admit, for floating within its molten power was land, a piece of rock sundered from the very Abyss itself during the Godwars. And on this piece of rock was the demoness of which I speak. This demoness, a creature of power, was able to harness a small portion of the very Maelstrom itself, surrounding her little piece of rock in a field of force, protecting it from the incredible forces which surrounded her. This field of force was both a blessing and a curse to this creature, for while it held the forces of the Maelstrom at bay, it also prevented her from leaving, making her a prisoner, unable to escape the fiery prison. The demon of which I speak is, of course, none other that Salystra, Queen of the Serpents and goddess of the evil dulim, whom you know yearns to escape from her stone prison and descend to Núrion and enslave all who dwell there," the huntsmaster said, his voice softening when he spoke the name of the dreaded Serpent Queen. "This demoness' attention was attracted to Al-Dustriel and her plight by the evil taint of the Dweller and the curse her presence had brought upon the house. And Salystra saw her chance. Pulling from the very power of the Maelstrom itself, Salystra funneled incredible energies, tainting them with her darkness and evil. Using the very channel created by Tal-Allustiel, the Serpent Queen sent her power down to Núrion. She materialized this power in the form of a snake she named The Serpent of Twilight, to mock the time of day the elves hold most dear." "Salystra had a plan when she created this serpent, for she saw the power Tal-Allustiel received when his followers called out his name in worship. He received power, power that Salystra wanted desperately." 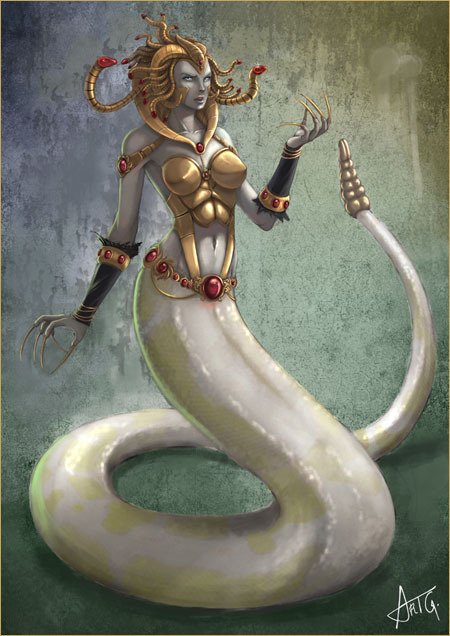 "She created the Serpent of Twilight to find worshippers for his Queen, so that she may increase in power and escape her fiery prison to descend to Núrion to rule it." Now, remember that Núrion wasn't as populated back then; the dwarves were a newly created race, and none of the other races had been made by the gods. None that is, save the orcs and other monsters, who as you all know are firmly under the yoke of the evil Vornoth. There were none left to worship the Queen of the Serpents, none save the Elhil. So that is where the Serpent was directed to strike, using its guile and trickery against the desperate elves of Al-Dustriel..."
"What happened next?" cried one rapt child. "Before I tell you, answer me this. As I have taught you much of the ways of the wild and the creatures therein, tell me what you know about serpents, in particular the viper," he asked, his tone one the children knew well, for they had been through many such lectures. "They don't eat very often, but when they do they eat a lot!" one child exclaimed. "They have poisonous venom!" another shouted. "They strike quickly," claimed another. "Yes, yes, you are all correct. They are patient hunters, willing to take their time before striking their prey. But when they do strike, they strike incredibly fast, their strikes filled with a deadly poison. And the Serpent of Twilight is no exception to this rule. And of course, their appetite knows no bounds." "The defeat of the elves of Al-Dustriel was imminent, as they realized their doom was to die at the hand of their righteous elven brethren. The Al-Dustrians were afraid, fearing for their lives and growing angry at Tal-Allustiel for deserting them when their need was the greatest." "And it was then that Salystra, smiling, ordered the Serpent of Twilight to strike." "Clothing itself in the guise of an elderly Elhil mage of considerable power, the Serpent made its way into Al-Dustriel with promises of an answer to defeat the attackers. He created a monolith, a huge stone structure 25 feet high in the middle of their fortification." "He explained what the monolith was: an artifact of power in which the mighty goddess Salystra had stored incredible energies, power capable of raining down destruction on the advancing army. And in this the serpent did not deceive, for the monolith was a thing of might from which the Al-Dustrians could unleash terrible destruction. " "The Serpent freely admitted that there was a price to pay for the power of the monolith, though, and the serpent readily told Balanuil and the council of elders what that price was. The power of the monolith was great, but it had a serious drawback. The energy which it stored was that of darkness and death, and when that power coursed through the wielder, it would sear his or her flesh, leaving blackness in its wake." "And at this Balanuil awoke from the deceived stupor in which the Dweller had left him, and he strongly condemned the act and advised the other elves of Al-Dustriel to submit to the justice of the other elves. But the Elhil of Al-Dustriel cared not, for their fear was great. They slew Balanuil with their daggers, and then they laid their hands on the monolith and called the name of Salystra, begging her aid against their enemies. And Salystra gladly complied, raining fire down upon the approaching elves and slaying most of them. Shattered, the approaching army fled, soundly defeated. The elves of Al-Dustriel, now blackened with the power, rejoiced, calling on the name of Salystra in praise for saving them. They called themselves the Dulim, or 'twice blessed,' for they were the greatest of races and now worshipped the greatest of the gods. And Salystra looked down on her people and was pleased. But the other elves changed the word Du to mean 'deceived', for they said the Dulim were the 'twice betrayed'." "The other Elhil were aghast at what had been done. These elves had turned to a foreign goddess, a demoness of evil, and their skin bore her mark forever. Tal-Allustiel called upon them to raise an even greater army and destroy these cursed ones, and this they did. The dulim tried to use the monolith against this new army, but its power was spent. They tried to flee across the face of the Hinterlands, but they found the sun stung their eyes. They learned they had no choice but to hide in the deep caves that riddle Núrion's core, and the darkness was a bittersweet balm to them." "It is in the Dark Deeps they remain to this day, their hatred of us growing in their hearts like a cancer. It is in the Dark Deeps that they work diligently, hoping one day to return to the surface where they can exact their revenge on us. And once on the surface, they seek to give power to their queen, that she may be free of her fiery prison and descend to Núrion." "So when you go to bed tonight, remember Salystra the Serpent Queen and her servant, the Serpent of Twilight. Know that they are watching you, looking for your weaknesses, looking for their opportunity. For it is not your death which the evil goddess desires-it is your life." Halin sat back and looked into the eyes of the young Elhil, seeing fear therein, the very fear he had hoped for, the very fear he had in his own eyes those centuries ago when this story had been told to him. He had hoped it was a lesson learned, one these youths would never forget. A few hours later, Halin was called from his reverie by two of the children. "Halin? May we meditate with you in your tent tonight?" one of the children asked, her voice quavering in fear. A broad smile crossed his face as he welcomed them in. Yes, it was a lesson learned.